The copy of this print in the British Museum has quite a few different elements from this one in the Lyon Collection. Immediately noticeable in the British Museum example is the lack of the inscription in the upper left quadrant. Also, the wall behind their puppet figure is solid and does not display a broad, dark band toward the floor. The other most glaring difference is that there are no shadows cast in their example. Other than that, the general layout is almost exactly the same. Bunraku puppet of young woman in kimono with traditional hairstyle propped up against a wall. A similar print from an edition of 130 and lacking baseboard, upper shadow, and upper left calligraphy is in the British Museum collection. The curator there, Smith, writes, "The date is supplied by the artist's widow. 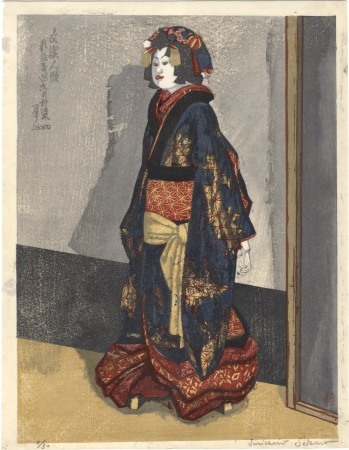 Among Sekino's many subjects for prints the Bunraku puppet theatre, which dates from the seventeenth century, was a favourite. In this work he shows the puppet standing without the two or three black-robed manipulators present in actual performance. So great is the sense of being alive which the operators are able to put into their puppets that this semi-lifeless pose must slightly shock anyone who has seen the Bunraku in action. Sekino also provides a virtually blank background which disguises the fact that puppets are less than one metre high and gives the illusion of a full-sized human being. As with the masks of the No drama, Bunraku puppet heads are types rather than individual characters; however, this example represents Osome, tragic heroine of the play 'The Love Suicide at Amijima' by Chikamatsu Monzaemon (1653-1724)."